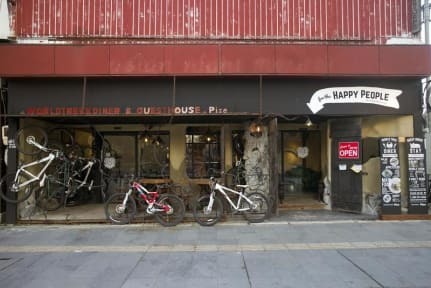 Worldtreck Diner & Guesthouse-Pise, a bar and restaurant serving great world foods is waiting for you at Nagano. You can play billiards at the guest house, and rental bicycle is also available. 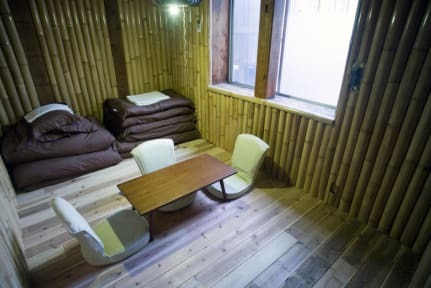 Guesthouse-Pise has 3 types of rooms: 1)Mixed dormitory; 2)Private Double room; and 3)Private Family room (Futon style room). All room has air-conditioning. The shower room, bathroom, and kitchen are shared with other customers. Mixed dormitory: Bunk beds have private space better than normal bunk beds (it is like a capsule bed). Each bed has private electrical outlets and reading lamps. 1).Check-in time is from 3pm to 8pm. Once you know you will not arrive in time, please call us as soon as possible. 2) We basically do not accept baggage drops before the check-in time (3pm). If you request for an early drop-offs, please contact us in advance. 3).We accept cash payment only upon arrival.